Whew! I can’t believe I’m actually online, able to update this blog. It rained all day yesterday and most of last night, the first real rain we’ve had in months. I was ecstatic to see it…right up until the time the weather knocked out my internet connection. It went out around 8:00 last night, and it’s still out. I’m only able to connect now thanks to someone else’s wireless internet and my husband’s laptop. The cable guy is supposed to come tomorrow morning, so somehow I’ll have to get along until then. Vary the amount of spices in this to suit your taste. I used the minimum amounts given, which put this right at the outer edge of my daughter’s spice tolerance. In a large pot, saute the onions, garlic, and bell pepper until the onions soften, about 3 minutes. Add the beans, seasonings, and tomatoes, and stir to combine. Add 3 cups vegetable broth or water. Reduce the heat to a simmer, and cook, uncovered, for about 1 hour, adding additional water or vegetable broth as needed to keep a soupy consistency. Just before serving, add the corn, if you like, and heat through. Serve in bowls with lime wedges. Makes 4-6 servings. I just found this recipe in my search for cold weather dishes. Thanks! Mmm! I just made this. Super tasty. Perfect for chilly weather. So I am not a vegan at all….but we are looking to make our lifes healthier here and there. Since we have had this soup, we have tried a number of meals and we love them. I am from the south, where you do not pass on the meats…but if I had this in front of me I would. Its great! Have a good day. What an odd comment to direct at a website run by a southern woman. I just made this. Modified slightly based on what I had in the house- used crushed tomatoes instead of diced and did use a little tiny bit of olive oil to saute the onion, pepper and garlic. It is EXCELLENT!! This ones a keeper, even my meat and potatoes husband loved it! Keep the good stuff coming!! This is sooo good! I am making pot number two for this week. Can't wait. I made this soup tonight. It sounded perfect because it was raining all day. This soup is awesome. I can't get enough of it. I didn't have canned diced tomatoes so I just diced some up myself (5 to be percise). My husband usually adds salt to everything that I make and this time he didn't. This soup is going to be a household staple. Susan, how do I adjust this to do in a pressure cooker? Or is it best not to? Craig, this is untested, but it's what I would do: Soak 1 1/2 cups of dried black beans over night. Saute the onion, etc., in your pressure cooker. Add the drained beans, water, seasonings, and tomatoes. Cover, bring to high pressure, and cook for 1o minutes. Remove from heat, let pressure come down naturally, and proceed with the rest of the recipe. This recipe looks delicious and I love that is it low carbs too. Can the black beans be substituted with Kidney beans? or other types of beans? I made this recipe today and it is awesome =). I had never used chipotle chiles in adobo before, but I'm so glad to have discovered them via your recipe(s)! My spicy-food loving husband and I are eternally grateful. Thank you so much for all of your great recipes. 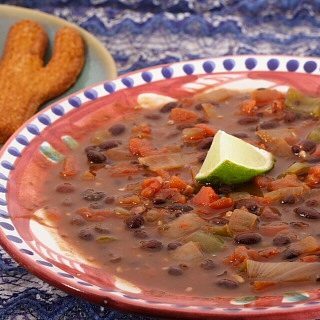 I was really in the mood for black bean soup, so of course, this blog was the first place I turned for a recipe. While this was good–and I actually followed it pretty closely, only omitting the corn because I'm watching carbs–it seemed to be missing something. Salt maybe? Not sure. Perhaps it needs to sit overnight for the flavors to mature. Good basic soup, but I'll need to see tomorrow if it's a make again recipe. Who cares about the soup! Love those cactus corn muffins! Nothing like a yard sale bargain! Great minds: here’s what i did for lunch – Black Bean & Baby Bella Chili. It was 11:30 – no bread, no lettuce – needed something to serve at noon; inventory pantry and frig and, voila, black beans and Baby Bella chili. Dump all in small pot, bring to boil and slowly simmer until time to serve or peppers are tender but not mushy. The mushroom slices held up well. Made this last night and loved it – the chipotle chili gave it such a smokey flavor! After sauteing the onions, etc., cover, bring to high pressure, cook for 6 minutes. Allow pressure to come down naturally or quick-release after 10 minutes. Oh, you should try it with about 1 cup less water and add more after it’s cooked if necessary. I saw this recipe a few hours ago and made it tonight. It was delicious and totally exceeded my expectations. Definitely a keeper, thank you! Looks terrific! How would I need to adjust it for a slow cooker? Thanks! We made this tonight for first time and cooked it in IP 3 mins, but will do 5 next time so I can add uncooked quinoa instead of cooked. I had added too much liquid, I think. I also added the corn, plus spinach after MPR. Will make it again. We liked it!! Thanks.